We have already described in some previous posts examples of projects with SiPM (SiPM Preamplifier, SiPM Gamma Detector , Broadband Amplifier for PMT and SiPM). In this post we want to describe an example of front-end electronics based on a voltage amplifier and a peak & hold circuit designed to read the amplitude of the pulse and then convert it into digital with an ADC. The amplifier diagram is presented in the “cover” image shown above. The SiPM is inversely polarized through 10 K R4, the voltage is stabilized with C5 of 100 nF. 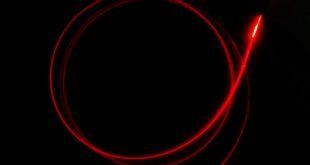 The signal is taken out from the 1 K load resistance R5 and sent to the amplifier via R1, which has the purpose of limiting the current absorption at rest. As operational amplifier we chose the OPA354 (SMD) component: it is a fast low-noise rail-to-rail CMOS operational with a band of 250 MHz, it is quite easy to find, cheap and easy to mount on an SMD-DIP adapter. The operational was used in a non-inverting configuration with a gain of 10. Downstream of the amplifier, the signal is sent to the Peak Detector & Hold circuit, shown in the diagram below. This is a classic Peak & Hold, also made with the OPA354 component, both for the follower function and the buffer function on the output. D1 and D2 are two Schottky diodes characterized by low threshold voltage and therefore suitable for this type of circuit. The peaking capacitor C2 was chosen of 10 nF, a compromise between charge rate and discharge speed. The feedback resistance R3, 1 K, has the function of smoothing the trend of the output signal. The peaking capacitor is discharged with a reset circuit controlled by a PSoC microcontroller, this part will be described in a following post. 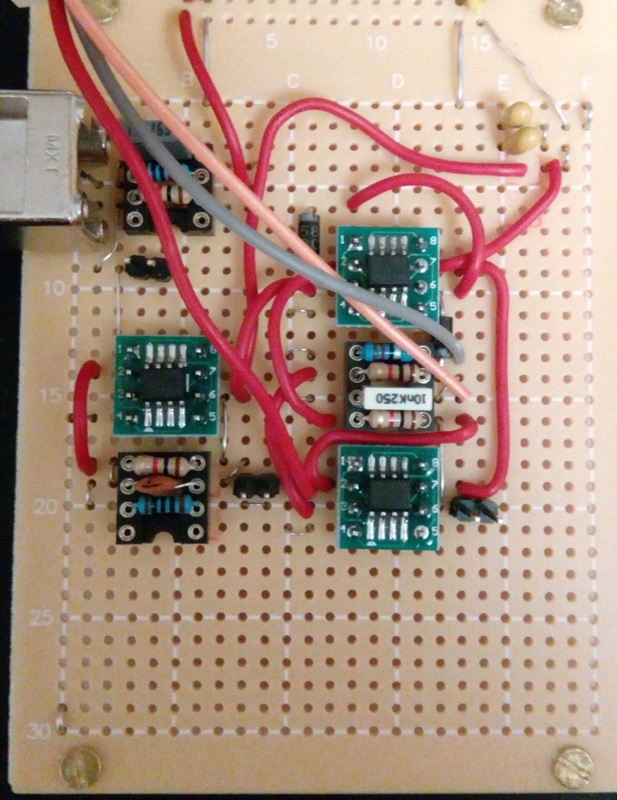 The image below shows the prototype of the circuit made on prototyping PCBs. On the left side there is the signal amplifier, while on the right side there is the Peak & Hold. In the plot below, the pulse produced by SiPM is shown, in yellow, and in blue the pulse obtained from the amplifier. You can see that the duration of the pulse is the same, a sign that the amplification stage does not introduce changes to the duration of the original pulse. The original pulse produced by SiPM on the load resistance of 1 K has a duration of about 1-2 μs, in case there was the need it could be made much narrower by reducing the load resistance up to 50 Ω. The following diagram shows in yellow the amplified pulse sent to the Peak & Hold and in blue the signal obtained from the Peak & Hold. 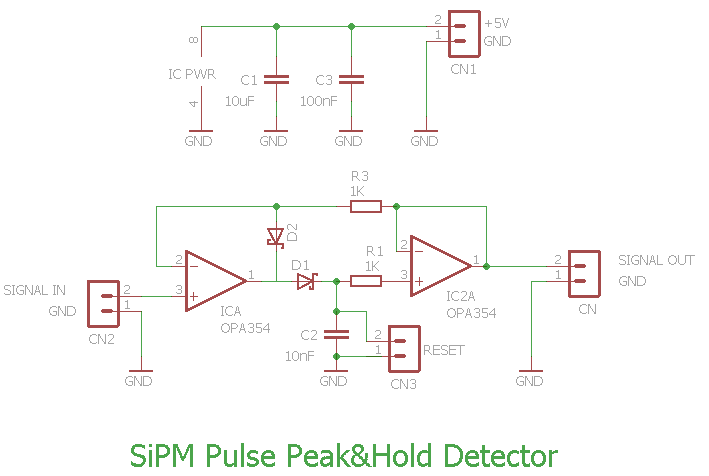 The maximum value of the pulse is kept constant even when the SiPM pulse decreases. To perform the digital conversion of the pulse amplitude with an ADC it is necessary to make sure that the reading task by the converter occurs when the signal produced by the Peak & Hold remains constant. After the reading it is necessary to “reset” the system discharging the peaking capacitor: this is obtained with a PSoC microcontroller which is synchronized on the rising edge of the pulse. In the trace below you can see the synchronization pulse in yellow. In the image below you can see the amplified pulse in yellow and the signal of the Peak & Hold in blue. The signal Peak & Hold has a duration of about 100 μs, after this time the capacitor is discharged and the signal has an exponential decrease in about 20-30 μs: at this point the system is ready to acquire a new pulse. In the chart below, the signal of the Peak & Hold, in blue, and the sampling interval, in yellow, are displayed; during the sampling interval the signal is acquired by the ADC and converted into digital. You can see how the signal remains constant throughout the sampling interval. In the chart below, the reset pulse that produces the discharge of the peaking capacitor is shown in yellow. The described prototype (amplifier and Peak & Hold) proved to be adequate for the acquisition of the pulses generated by a SiPM coupled to a scintillator. 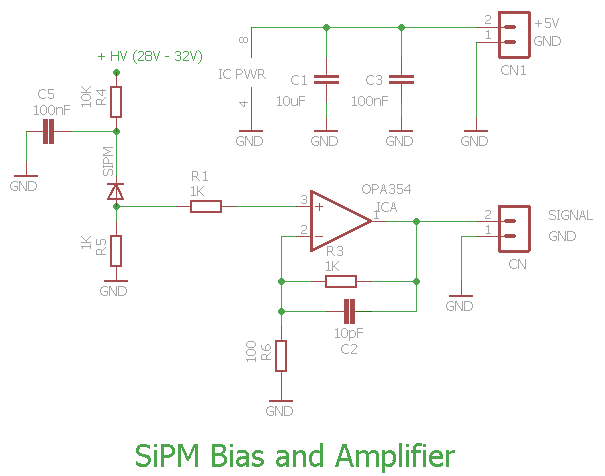 To complete the system, the section for generating the bias voltage of the SiPM must be added (described in the post Programmable Power Supply for SiPM Bias). It is also necessary to add the acquisition part of the signal, realized by means of a microcontroller, for example of the PSoC type. This will be described in the next post.